If I’d finished this two days ago, there might have been a 28 Days Later movie reference here! Oh wait, there still is! This year’s Southwest Show took place on 27th February, and while this year it attracted fewer paying customers through the door than last year (more on that later) there was still a positive vibe, and people – both visitors and exhibitors – seem to have enjoyed the day. So much so that, with next year’s date already set, all but two of this year’s exhibitors have already confirmed attendance. Next year’s date? That’ll be 25th February, 2017, and the show will be held at the same location; The Webbington Hotel in Somerset, where every Southwest Show has been held since the first, which I believe took place in 1998, some 18 years ago*. But that’s next year (and previous years) – let’s get back to this year. As is normal for RISC OS shows there was a ‘show theatre’, with presentations by Chris Evans for CJE Micro’s, Steve Revill and Rob Sprowson for RISC OS Open Ltd, and Andrew Rawnsley for R-Comp. I played with making video recordings of the talks – as I’ve taken to doing at Wakefield – but quickly realised that it wasn’t practical, and gave up. This was largely due to the ‘mobile’ nature of the show theatre, with the talks being given at the stands of the respective companies – but I intend to purchase some additional equipment before next year’s show, in the hope that this problem can be worked around. The room was laid out in a similar ‘U’ to last year, with exhibitors lining both the inner and outer sides of the shape, so my trusty coin can take another break and take the same route around the show as before. The first port of call on entering the hall was ROUGOL, represented by Bryan Hogan – and helping out for some of the day taking visitors’ money in return for a ticket. This gave him the opportunity to punt both the London user group, and the London Show, which will be taking place this year on 29th October. 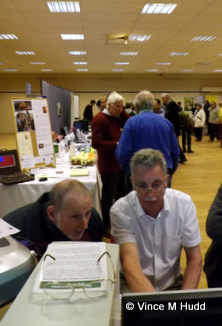 After Bryan, Richard Brown – the first half of the Dynamic Duo who organises the event, along with R-Comp’s Andrew Rawnsley – was manning the Orpheus Internet Stand. Orpheus was originally formed by the late Paul Vigay, and continues to be the RISC OS-friendly ISP that Paul set it up to be (though there’s nothing stopping you from using it with computers running other operating systems as well). North One Communications were next, with the latest version of Organizer, the – no, THE – personal information manager for RISC OS. Version 2.24 of the application itself was launched at London 2015, and brought improvements to the way it works with mapping software RiscOSM from Sine Nomine, as well as other enhancements. 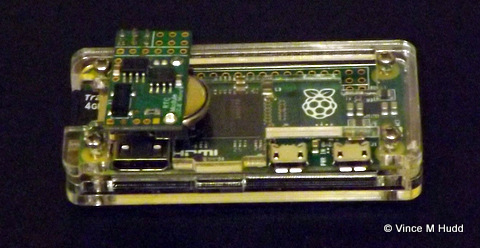 This version, along with RPCEmu 8.14 and RISC OS 5.22, formed a new edition of Rat-Organizer-on-a-Stick, which North One’s Cut-Me-Own-Throat Dibbler Nigel Willmott was talking about and selling. At the bottom of the inner part of the ‘U’ was Christopher Dewhurst, editor of on-off-on-off-under-new-management PDF magazine Drag ‘N Drop. The latest is volume seven issue two, a 48 page issue that came out earlier in the month, and has a bit of a programming and sound slant to it. As usual, Chris was selling a bundle of all of the latest issues to date on a USB stick, as well as his Book of Draw Stuff, and other items. 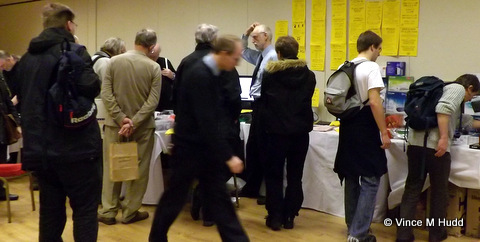 Turning the corner to venture up the other side was the well stocked charity stand – manned as ever by Moss and co. This year the money raised went to Bristol and Wales Cat Rescue, which aims to rescue unwanted cats and find them new homes with staff owners who will serve their every need, obediently and without fail properly care for their new feline friend. 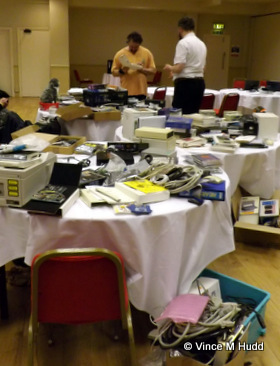 The amount raised this year was a phenomenal £420 – £414.08 of which was taken at the show itself, but Moss then managed to sell something to his eldest son when he returned home, bringing the total up slightly. Given the number of visitors to this year’s show – see below – that’s a truly impressive result. 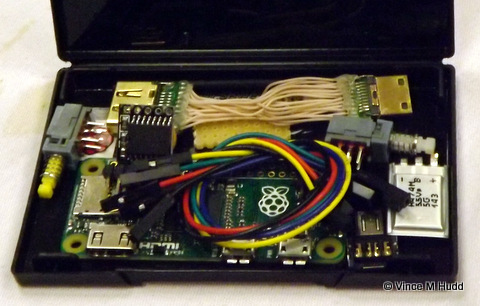 Occupying a round table in the Raspberry Pi area, Steve Drain had once again brought along his tablet form factor RISC OS device – a Raspberry Pi, cased with a 7″ screen, running at a resolution of 800 x 480 (and with a full 16 million colours). Although the device itself has a tablet form factor, it isn’t a touch screen device, so a mouse and keyboard are still required in order to actually use the operating system, and in Steve’s case, it’s a suitably small keyboard with a built in touch pad. Suitable, that is, for Hobbits and other races of a more diminutive size. 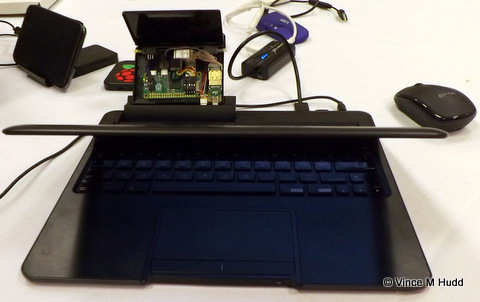 Steve also had one of his Raspberry Pip devices – this version based around a Pi Zero, whereas he had previously used a Model A – connected to a Motorola Atrix Lapdock, thus providing a laptop form factor with a slightly bigger keyboard and screen, at 11.6″. One of the computers the company was showing off was their brand new Titanium-based RapidO Ti computer, which follows on from its slightly older brother, the IGEPv5-based Eastwood RapidO Ig. The new machine was announced in the week running up to the show, with some aspects of the specification yet to be decided. 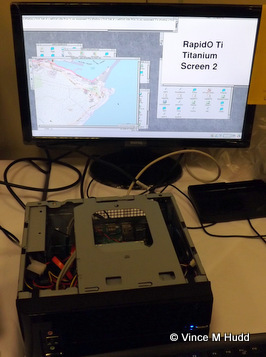 The machine, based around Elesar Ltd’s new motherboard, was being operated with two screens – an ability also being demonstrated on the RISC OS Open Ltd stand. One of those screens, however, was a refurbished model that had a display fault resulting in vertical lines of corrupted display, and which the company was hoping to sell – arguably not the best approach to demonstrating a newly launched machine, since any visitors who saw this but didn’t speak to either Chris or Andrew may have gone away thinking the fault was with the computer itself. Moving along, Fortran Friends had the next stand. Fortran Friends – as the name suggest – is aimed at people who use the Fortran programming language, which is particularly suited to scientific applications. The group were showing off their polyhedra, colourful three dimensional shapes with faces and edges that can be extended to produce newer, bigger shapes – a process called stellation. The group provides software that can be used to explore these shapes, and what can be done with them. 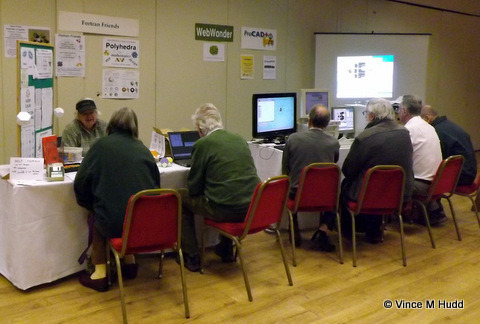 Next to Fortran Friends was David Snell, with Web Wonder and ProCAD+. Web Wonder is an application for creating websites, aimed at those who want a simple site but sidestepping the need to learn HTML or CSS. 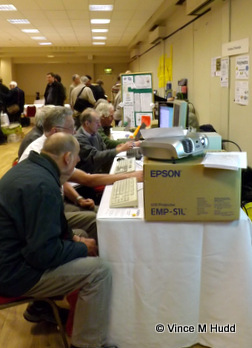 The software offers a wealth of features, ranging from standard HTML features like tables, through to more specialist areas, with support for genealogy related pages, for example. ProCAD+, meanwhile, is a very comprehensive computer aided design package, which David says is very easy to use. Amongst many other capabilities, the software is able to import NTF and GML files – both of which relate to mapping data. There is also an additional application called ProOSM+, an OpenStreetMap interpreter which turns downloaded OSM data into files that can be edited in ProCAD+. The proud centrepiece of the room was John Norris‘ dumbbell – or at least it should have been but, as before, it was actually found to be found in the far corner. The bell itself is made of papier maché – which means it doesn’t actually ring. Mounted in a tall wooden frame, the idea is to provide the user with the means to practice the art of campanology but without annoying the neighbours, which a real bell would probably do. Instead, a sensor attached to the rig detects the bell’s motion as the user pulls on the rope, and relays that information to a computer, and that computer then makes the appropriate sounds, which the user could be listening to via a set of headphones. Alternatively, some people might consider annoying the neighbours to be a worthy goal – in which case the output could be fed through to a really powerful amp and speakers. That would probably do the trick. Another way to annoy the neighbours is to have better jam on your toast than them – although how they’d find out is another matter. One solution would be to use that same amp and speakers, with the aid of a microphone, with which the superiority of the jam could be announced. Where to get that jam, though? Easy! From John’s wife, Mary, who was selling her Tasty Treats – a selection of jams, jellies and chutneys – at the the show. 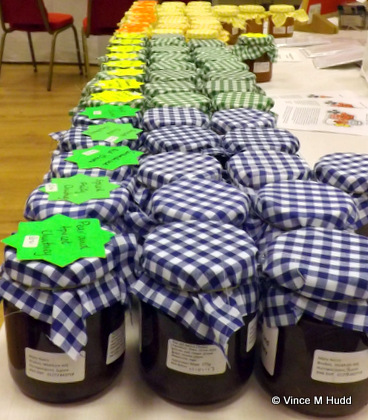 As ever, there were a range of flavours – but Mary had only a small number of jars of raspberry jam, so I’m glad I made my purchase early in the day. 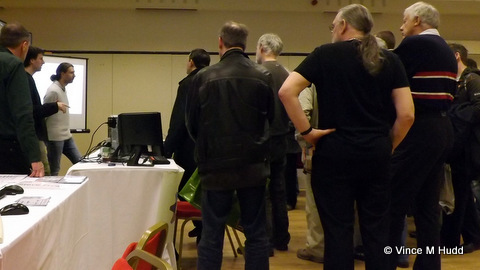 Speaking of me, I was next on the Soft Rock Software stand, where I was able to talk about and demonstrate software such as WebChange, allow visitors to play old games such as Floopy, and to show off the latest versions of the RiscPiC cases for the Raspberry Pi. Better than that, this year I actually remembered to bring my stock of -mini cases with me, so I was also able to sell some of those cases! 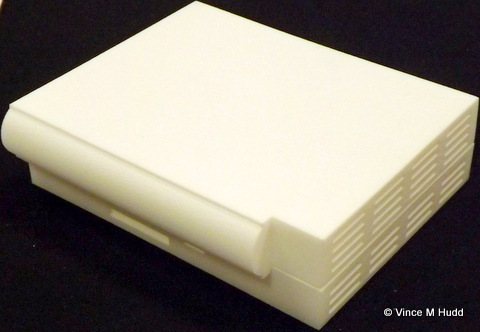 The RiscPiC-mini is the smaller case, with the larger, standard case still not yet ready – the most recent attempt, which was on display on the stand, is noticeably warped (though for the base, that has since been corrected; just the top to get right now). 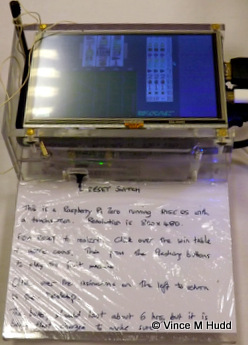 Also on my stand was fellow Bristol user Chris Hall’s latest project: A Raspberry Pi Zero connected to a touchscreen (operating at a resolution of 800×480) – with no keyboard or mouse connected. Visitors were able to play Chris’ fruit machine simulator on it, using a stylus to tap the (very fine on such a small screen) controls. The whole thing can be run from a battery, which Chris estimates should last about six hours – though it was being float charged at the show just to make sure. In a move designed to prevent me taking legal action against him for infringing my “I haven’t had time…” trademark, Steve Fryatt had discovered a hitherto unrealised stash of time (probably down the back of the sofa), and used it to produce new versions of Cashbook, PrintPDF and Locate. These could be bought on CD for a fiver, with the proceeds of his sales going to the British Heart Foundation. 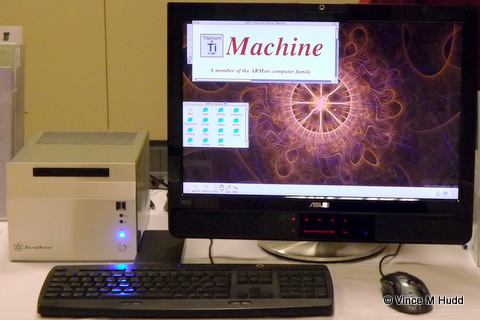 We were promised a two headed beast on the RISC OS Open stand, and we weren’t disappointed – a Titanium-based computer was on display, with its video output going to two screens. The operating system itself needs a little work for a dual monitor set up in practice – though it can be used. One issue is error and messages boxes (or other windows) opening at the centre of the combined display, which means they are split down the middle by the bezels of the two monitors. Another is the icon bar, which presently shows left-end icons (hardware, drives, etc.) at that end of the left display, and right-end icons (apps, the switcher, etc.) at that end of the right display. These are things which need to be addressed before such a system can really be considered practical. Along with the Titanium machine, the company – represented at the show by Steve Revill and Elesar‘s Rob Sprowson – were selling the usual merchandise: SD and micro-SD cards with RISC OS pre-installed for use in the Raspberry Pi, the ‘Nut Pi’ cards containing a good value range of software for the Pi, the desktop development environment, and so on. Speaking of Rob’s company: In case you didn’t know, the name ‘Elesar’ is the phonetic pronunciation of the ARM instruction LSR – logical shift right – and he chose to name the Titanium motherboard for an element because elements can’t be trademarked, which means there’s no danger of someone else coming along and taking him to court over the name. 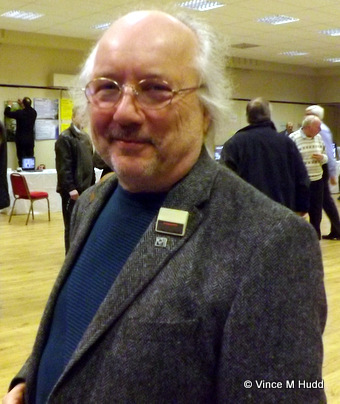 In an unusual turn of events, partly caused by Richard Brown telling him the show opened slightly earlier than it did (which really was an accident, and not a cunning plan – I was there when his mistake was pointed out to him), Jim Nagel was not only at the Southwest Show, but he was there on time. Unfortunately, though, he had been unable to get the latest edition of Archive Magazine ready in time, so he brought along a ‘sampler’ – an Archive-sized, 8 page print previewing two articles we can expect to see in issue 24:1; one featuring show news – items referring to what visitors could expect to see at the show, and the other a feature on bell-ringing. Tony Bartram was on the next table, representing AmCog Games. Tony is currently working on a new game, which he describes as being not unlike Fervour, a game brought out by Clares in the early 1990s. In the game from Clares, the player guides a Terrahawk-like ball along a 3D perspective track, collecting bonuses and avoiding obstacles – though it’s not a Terrahawk in Tony’s game, as this early screen grab shows. 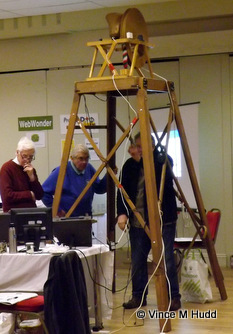 He’s aiming to launch the game at the Wakefield Show, which this year takes place on 16th April. For the Southwest Show, although there was no new game available, Tony was showing off a new quest for Legends of Magic, called Treasure Quest. The game was released at London 2016, and the new quest is available as a free update via PlingStore using the code provided in the case when the game was purchased. An issue with some newer hardware – such as the Titanium and the IGEPv5 – is that in some cases, and with some software, graphics are displayed with the red and blue components swapped, so things that should be red are displayed blue, and vice versa. One of a number of affected applications is Artworks2 from MW Software, and although it’s not yet available to buy, Martin Wuerthner – who once again made a welcome appearance at the Southwest Show, having not made it to London – did have a test version of the software which addresses this problem, so we can expect that update to become readily available in the not too distant future. Martin is on the list of exhibitors for Wakefield, so perhaps we’ll see the new version available then. The final stand of the day was R-Comp‘s, where another new Titanium-based computer was available in the form of their TiMachine (pronounced Time Machine). 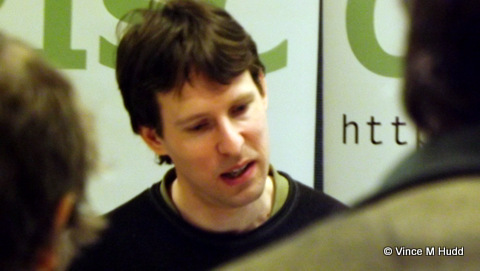 Andrew Rawnsley described the machine as an early access one, explaining that he prefers to only release things in a more finished state, but that software compatibility issues might be a problem at this stage with Titanium – so by labelling it as early access, he’s aiming to make sure those keen on getting their hands on a computer based around the newest RISC OS technology know that there may still be work to do on it. Fair enough. 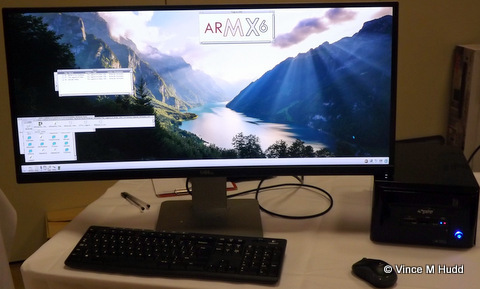 Andrew and company were also demonstrating their other flashy hardware – the ARMSX ARMX6 – running with a 3840×1440 display on an ultra high definition monitor, and with its audio being sent over HDMI and output via a sound bar. With audio over HDMI, the device at the receiving end that has the speaker(s) attached or built in turns the digital representation of the sound into actual sound, so this can give much better quality audio with decent equipment, and also reduces the effort being expended by the computer in doing that part of the work. So that was Southwest 2016. What you need now are the rest of my pictures – or at least those I’ve edited into a usable state – which I’ve included below. And if you want more pictures, Steve Fryatt has also published a selection. I say, sir, what’s that on your collar? 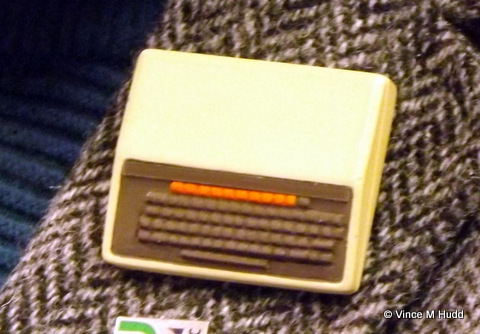 Why it’s the smallest BBC Micro you’ll see at Southwest 2016! You’ll notice a gap between 1999 and 2001 – I was unable to find a date for 2000. However, I was told a couple of years ago that there was a year in which a Southwest Show wasn’t held, so that’s probably it.